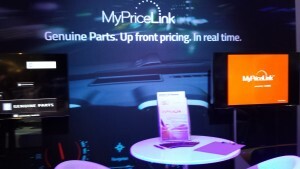 Shops hunting for OEM General Motors parts on MyPriceLink shouldn’t expect big price swings — or big glitches — this week as the dynamic list pricing service goes live Tuesday. “We’re probably going to be very conservative Day One,” GM wholesale dealer, customer care and aftersales manager John Eck said last week. The launch week will be more dedicated towards encouraging industry adoption and ensuring “the plumbing is working,” Eck said. However, he said GM is “very confident” the dynamic, real-time list pricing won’t cause any technical issues as the values automatically flow into every AudaExplore, CCC (CCC ONE and Comp-Est), Mitchell and Web-Est estimating system. MyPriceLink will technically go live at 12:01 a.m. Eastern, but the estimating services will integrate the service out on their own schedules that day, according to Eck. Eck praised the estimating systems for their help in developing the system, calling the process an “intense collaboration.” He said the company was appreciative of how all the stakeholders — insurers, shops, dealers, IPs and DMS providers — came together over the past year after the SEMA 2014 uproar and produced a solution acceptable to all parties. Though GM has the capability to adjust prices dramatically and frequently, Eck said it likely wouldn’t be doing so at first. Out of the company’s 100,000 parts, only a few thousand were really competitive, and those were more likely to be handled through the Bump the Competition program outside of the MyPriceLink-IP interactions, according to Eck. So why even have MyPriceLink, if the major savings are likely to be handled outside of it? Eck likened it to a VIN scrubber able to give a shop immediate access to the vehicle’s most current build data by connecting online. There was no need to use antiquated systems like checking a CD-ROM — the information on which might have been outdated anyway. “Why can’t pricing (act) the same?” Eck said. Besides list price changes, GM adds new part numbers every month and needs to tweak the listings made available to the industry.